Lightwave International is a multi-talented production company specializing in dazzling laser light shows and laser special effects for the touring concert industry, movies, television, corporate theater, marketing, and large-scale civic events. "We help clients wow audiences by offering full production and equipment rentals; whether through special effects or something totally unprecedented and unique." Lightwave International is a multi-talented production company specializing in dazzling laser light shows and laser special effects for the touring concert industry, movies, television, corporate theater, marketing, and large-scale civic events. Sale and turnkey rental of laser projectors, laser accessories, cryo equipment, FogScreens, water screens, and other special effects are also offered. Lightwave has accompanied major artists on multi-year world tours including acts such as: Madonna, Rihanna, Roger Waters / Pink Floyd, Kanye West, Jay-Z, Katy Perry, The Killers, Ke$ha, Skrillex, Tom Petty, Korn, Jane’s Addiction, Shakira, and many more. Lightwave’s work can be seen in recent movies such as Transformers 3, Oblivion, Captain America: Winter Soldier, and Cowboys & Aliens as well as in hundreds of music videos, commercials, and live television events. 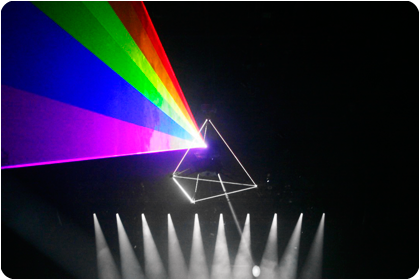 Lightwave is internationally renowned for creation of the world’s largest full-color entertainment lasers, creation of the Pink Floyd laser prism, world-firsts and records in audience scanning, solid state laser systems, and creative mashups of art and technology. Lightwave is a fabricator of laser systems and a Coherent Premium Certified Integrator of OPS Laser sources. Lightwave is also a distributor of Arctos Laser Projectors and Pangolin Laser Systems. Since 1985 Lightwave has performed tens of thousands of events for millions of audience members worldwide, reaching hundreds of countries on every continent except Antarctica.